GreenWorks 80v battery-powered — As powerful as a 45cc gas chainsaw. In my opinion, cordless chainsaws are the ultimate chainsaw for a lot of good reasons. For starters, they are quiet, they don’t emit fumes, they are lightweight, they require almost zero maintenance, you don’t need to fuss with gas or electrical cords, and they are cool tools in every way possible. Sure, cordless chainsaws don’t have the power of a gas chainsaw. I understand. That’s absolutely true, but most homeowners don’t need to cut down 36″ redwood trees. Let’s be honest, most homeowners, people like you and I, need a cordless chainsaw for small jobs around the yard: trimming, pruning, felling relatively small trees or maybe even cleaning up after a storm. A battery chainsaw is perfect for ‘most’ people, especially nowadays with the powerful EGO Power+ 56V (CS1403) or the GreenWorks 80V (GCS80420) Chainsaw. The EGO 56V Power+ has an excellent reputation for power & reliability. Times have changed. Cordless chainsaws are getting better and better so forget about what your mom or dad said. When you’re looking for a chainsaw to take on a project around the yard, naturally you’re going to want a decent model that is well-made, easy to use, and gets the job done efficiently. Cordless chainsaws provide the power you need for light to moderate cutting tasks with greater convenience. Here are some valuable tips and need-to-know info on cordless models if you are contemplating on getting one. How Do Cordless Chainsaws Work? So, obviously a cordless chainsaw is powered by a battery that is rechargeable. Instead of fuel, the motor of the saw operates using battery power to drive the metal chain around the guide bar. This eliminates the need for mixing oil and gas to lubricate internal parts. The chain on a cordless model is typical of the ones you see on all chainsaw types. It consists of rugged cutting teeth that move along the guide bar. As the spinning chain comes in contact with the material that is being cut, the ‘teeth’ are dragged along the surface as they cut through. While there is no oil mixing involved, you do still have to keep the chain well lubricated using a specific oil designed for chainsaws. Chainsaw bar oil is ideal because it will ensure that the unit runs smoothly and won’t snag. Many of the newer cordless chainsaws are designed with an oil chamber that automatically supplies oil to the chain for greater ease of use. It is important to note that the batteries used to power chainsaws are powerful and they can take approximately 30 minutes to over 2 hours to become fully charged. This, of course, depends on the voltage and amp-hours of the battery, which will be explained shortly. Lithium-ion batteries pack a lot of energy in a small area. The batteries that are designed for cordless chainsaws are a bit pricey if you’re considering purchasing an extra as a backup option; however, many manufacturers of battery-powered tools are designed to use the batteries interchangeably. This can be a great money-saver if you already own a battery-powered tool that is of the same voltage and brand name as the chainsaw you choose. How do the cordless chainsaws compare to the electric and gas chainsaw models? 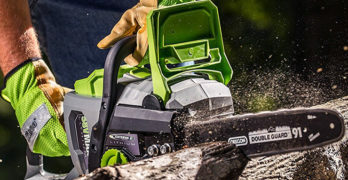 Fuel powered and electric chainsaws are more common, with gas being the most powerful, but newer cordless chainsaws offer many advantages over these traditional models. Cordless chainsaws operate quietly in comparison to all others, even corded electric models. They are far more versatile. A cordless model can be used nearly anywhere due to the power provided by a rechargeable battery. The cordless chainsaw is lightweight and easier to handle than models with larger gas-powered engines or electric models with cords that can get tangled up. They require less maintenance than gas-powered engines because there is no oil mixing involved. They’re better for the environment. A battery-operated power tool is far less harmful to the environment as it doesn’t emit exhaust into the air like gas models or leak fuel. Gas chainsaws are great for people who need raw power. The GreenWorks 80V is as powerful as this Makita EA4300F40B 42cc gas saw. These models are much more mobile, clean running, and quiet to operate over gas. The noise output of a cordless model is significantly lower than gas-powered models, making these much more neighborhood-friendly. You can even operate one without the requirement of wearing hearing protection. Since the battery pack attaches to the unit, you also have the freedom of not being restricted to a defined area that is within reach of an electricity source. Most cordless chainsaws are designed with a handy and ergonomic design – they are easy to control with low-vibration. You can actually use them in place of other models for harder to reach jobs like trimming branches that are close together. Additionally, they’re designed to pause when you stop trimming for a certain amount of time to conserve the battery. They’re much easier to start back up than fuel-powered as well. Use in areas with restricted noise levels on power tools. They’re more lightweight to keep the chainsaw relatively light and easier to handle. The power they give remains consistent, even as the battery discharges. You do not have to wait for them to be fully discharged for you to charge them again. Longer power retention – They retain power better than traditional batteries even when they are left off of the charger for days or weeks at a time. Lithium-ion batteries typically have a longer run-time and you can put them recharging even if they still have some charge left in them without damaging the battery life. Another factor to keep in mind when you’re looking at cordless power tools is the specifications listed on the battery as well as the chainsaw. Why is this important? If you need to know the power capacity the chainsaw can put out and for how long, it’s important to understand these specs. The power of a cordless chainsaw is not determined in terms of horsepower. Instead, it is indicated by voltage. Cordless electric chainsaws on average range from 18V-36V with some models as high 80V for heavy-duty work. Higher voltage means greater power and faster turn speed of the chain. Be sure to pay close attention to the battery specs that are offered with the cordless chainsaw model you’re choosing as well. You will often see a number and an abbreviation listed as Ah following the voltage indicated on the battery. This stands for amp-hours (amperes) and is the unit of measurement that batteries are typically rated by. Most cordless units are offered with a battery pack of 2.0Ah or 4.0Ah and some even greater (as an additional purchase to the machine). The amp-hour rating indicates an approximate amount of the battery’s charge capacity — or approximately how long it will supply a certain current flow to a load until completely discharged. The specific amount of run time will vary across different battery designs and manufacturers among other factors, such as the amount of load that’s applied to it. In most cases, you can expect a 4.0Ah battery to last twice as long as a 2.0Ah battery (likewise, it will take longer to fully recharge). Higher amp-hour batteries will also cost more, so before you venture out and splurge on one with a higher rating consider the jobs you will likely use it for. Look for cordless chainsaws that have a gauge on the battery to indicate approximately how much charge is left. This allows you to tighten the chain on the saw without the use of extra tools. The tool-less tightening systems featured on specific models are generally knobs that you can simply turn to adjust the chain tension so it isn’t hanging from the bar. This is quite handy in the event that the chain gets loose at some point when working, which could be dangerous. It makes working with the chainsaw much easier and more efficient as you don’t have to interrupt your job to go searching for a wrench or a screwdriver. Here’s an idea of some great models to choose from among the cordless variety for overall performance and quality. Sleek, powerful and durable. A great modern chainsaw. Includes: 2.0 Ah battery and charger. This is one of the most popular brands in battery powered lawn care and gardening tools. The 80-V 18-inch chainsaw has the power and performance that is equivalent to a gas powered machine for optimal efficiency for the job at hand. 80V Li-Ion battery powered chainsaw. Equal to a 45cc gas engine. 150 cuts with a fully charged 2.0 Ah battery (included). Steel bucking spikes and comfortable metal wrap around handle. Powerful, lightweight, clean energy and minimal maintenance. ✓ View or download the MANUAL for the GreenWorks 80V cordless chainsaw. There is no oil mixing required and it starts up at just the push of a button rather than a pull start. It comes with a 2Ah battery that has the capability of up to 150 cuts on a full charge. The 2Ah battery can fully be charged within 30 minutes using the included charger so you can get back to your cutting jobs faster. It works harmoniously with the DigiPro brushless motor to provide ample power. Video | See what the GreenWorks 80V GCS80420 can do. The weight of the chainsaw is well balanced between the bar and the engine. This makes handling and carrying it around easy and more comfortable in addition to the large wrap-around handle. The chain tensioning does require a screwdriver and a wrench, but is easy to do. There is actually a handy built-in storage compartment in the handle that stores the wrench for tightening the bolts. There’s also a delay shut-off feature that will automatically shut off the motor after a period of non-use as a means to conserve the battery life. Super fast charging means very little down time. Consider a 2nd battery. 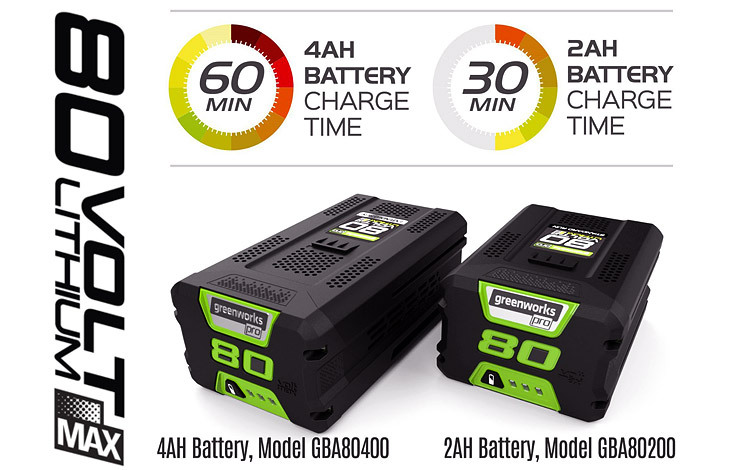 The battery pack available with the chainsaw is the 80V 2Ah battery with charger or you can opt for just the chainsaw only, if you already own a battery pack from another GreenWorks battery-powered tool. GreenWorks produces a line of battery-powered tools that you can use batteries interchangeably and the 80V chainsaw is no different. It can be used with an 80V 4Ah battery pack available through GreenWorks and also works with the same battery charger. Low noise and zero maintenance make this an excellent choice. ✓ View or download the MANUAL for the EGO Power+ cordless chainsaw. This chainsaw is equipped with a 14” Oregon bar and chain for lighter duty jobs like cutting smaller trees, branches and wood. The brushless motor delivers up to 100 smooth cuts on a full charge with the 2.5Ah Lithium-ion battery. The chainsaw comes with the bar oil needed to keep the chain and bar adequately lubricated. Easy to handle and maneuver. Sufficient power with a fast motor turn speed. Interchangeable with other battery packs. Equipped with a chain kickback brake. A notable quality with this chainsaw is the overload protection feature. It works effortlessly to deliver smooth cuts; however, if you put too much load than necessary it will automatically shut off. This feature prevents causing damage to the brushless motor, extending the life of your chainsaw. The only issue is to keep a close eye on the oil as the chainsaw will run through it quickly. If the bar isn’t sufficiently lubricated this can run down the life of the motor. It’s not a significant drawback of the model, but there really aren’t any major drawbacks. It’s an overall great quality and value in cordless chainsaws. 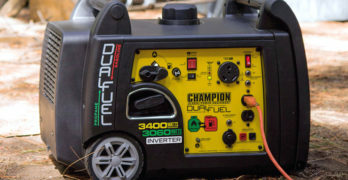 The standard charger that comes with the chainsaw (in the battery pack + charger package available) charges a 2.0Ah battery from 0 to full in 40 minutes. It is equipped with a fan cooled system to prevent overheating of the battery and charger. EGO also has a rapid charger they offer for their battery packs that offers the fastest charge time: just 25 minutes to fully charge the 56V 2.0Ah battery. Premium battery with plenty of juice to finish all of your tasks. Great design and ultra-fast charging times. If you want to dramatically increase your charging speed then you’ll have to spend a little more money and invest in the EGO CH5500 fast charger. Personally, I wish this was the default charger for the EGO cordless chainsaw but I guess the company is trying to make some extra money by selling it separately. In the long run I think it’s a good investment, especially if you plan on using your EGO tools for big projects. Fan Cooled Charging System will prevent the battery and charger from overheating. Integrated Fuel Gauge tells you how much power remains in the battery. Integrated LED Charge Indicator Lights informs you of charge level. We’ve covered the EGO Power+ chainsaw in the past so if you want to learn more we recommend reading our in-depth article on this excellent cordless chainsaw that homeowners will truly love and appreciate over time. Learn more about brushless motors. Well-balanced, compact and engineered to last for years to come. “Tool-less” chain adjustment for convenient operation and maintenance. 12″ guide bar for increased capacity. Cordless for reduced maintenance; no need to change engine oil or spark plug, clean air filter or drain fuel for storage. Weighs only 10 lbs. with battery for easy handling. Rubberized soft grip top handle allows operator to apply more even cutting pressure. Instant start-up: simply load a 36V battery and the saw is ready to use. Large oil filling port with view window allows operator to easily add and check bar oil level. The Makita 36V cordless chainsaw is designed with a Makita-built motor to deliver fast cutting speed . The 36V battery that comes standard with the chainsaw provides instant start-up for fast and powerful performance straight out of the box. You cannot use battery packs interchangeably with different chargers. Easy to handle and ultra-lightweight. Great for small tasks around the yard. There are plenty of desirable qualities in this chainsaw with similar features to gas-fueled chainsaws for easier converting from a fuel-powered to a battery powered model. The chain stops when you release the trigger and also features a safety release bar. The front hand guard is designed to initiate the electric brake when it’s engaged as an additional safety measure. The 36V battery (BL3622A) that is included has built-in shock absorbing features designed to help extend the life of the battery. It can be used interchangeably with other battery-powered tools by Makita but they are specifically designed to work only with the charger that is specified for the battery type. If you can afford it, I’d recommend a 2nd battery to eliminate down time. Self-sharpening system gives this a significant advantage over other chainsaws. Oregon is the leading manufacturer of the chains equipped on many cordless chainsaw models (including EGO). The 40V CS300-A6 cordless chainsaw has the power and capability for professional users as well as homeowners alike for light to medium jobs. The brushless motor can deliver up to an incredible 400 cuts for branches around 2-3” in diameter on a single charge. 40-Volt MAX lithium ion. Constant no-fade power. Can hold a charge even when being stored, for months. Brushless Motor technology. High torque for fast cutting. Instant start. No fumes. No pull cord. Very easy to use and maneuver. PowerSharp system — Pull the lever and instantly sharpen your chain in seconds. Impressive technology. 4 times quieter than a gas saw in use, silent between cuts, lightweight and well-balanced, low vibration. Run-time — Cuts approximately 400 branches (2-3 Inch in diameter) on a single battery charge. Charge Time — Completely discharged 4.0Ah Battery Pack will charge in approximately 210 minutes. One standout feature with this model that you don’t see on most chainsaws is the PowerSharp system. This sharpens the saw right on the spot within seconds! It is fairly lightweight, weighing just 12 pounds with the battery, evenly balanced and has low vibration to offer more comfortable handling. That is a considerable attribute given the run-time you get from the brushless motor. It’s also worth noting that this chainsaw is meant to handle trimming and cutting branches that are smaller in diameter. **Important note : beware of the model numbers when you’re ordering because these come in different battery pack options. This 40V CS300-A6 model with the 4.0Ah battery pack will run for 66% longer than the CS300-E6 model. This battery pack comes with a standard charger that recharges in approximately 240 minutes. Keep in mind the run time of the motor is more than sufficient to get most of your average jobs done. Weighs approximately 2.7 lbs. Holds 90% of charge while in storage. If you’re needing a chainsaw for occasional use and not for longer periods of time, the 2.4 Ah battery pack (B400E) option in the CS300-E6 model only takes approximately 90-120 minutes. 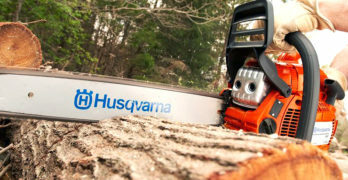 The lithium-ion batteries designed for these chainsaws are engineered with premium cell technology so power won’t fade as the battery discharges and will retain its charge longer during storage. The OREGON CS300 chainsaw option is for the saw only and does not include the battery pack or the charger. This package makes sense if you already have the charger and a battery, otherwise get a package deal. ✓ View or download the MANUAL or the PRODUCT SHEET. Excellent alternative to a gas chainsaw. Fast cutting & lightweight. Another very big brand name in power equipment, DEWALT also offers cordless power tools for greater convenience over gas types. The 40V 6Ah Lithium-ion XR brushless chainsaw has the power and speed to cut through wood of various diameters for exceptional performance capability. Low kick back 16″ Oregon bar and chain. Efficient brushless motor maximizes battery life. Chain brake protects you from accidental kickback. Variable speed trigger provides more control. Part of the 40V MAX* system of Outdoor Power Equipment. This chainsaw offers a lot of convenience over gas with easy start up and low maintenance, but the automatic oiling system adds further convenience over other cordless chainsaws. The variable speed trigger allows you to control the chain speed for different cutting tasks. The 40V 4Ah battery features a bar gauge to let you know when the battery is draining so you can put it recharging before it dies completely. Since Lithium-ion batteries don’t ‘fade’ or slow down as the power drains the machine will just stop without warning when the battery is completely depleted, so this is a useful feature). 6.0 Ah battery will last you over an hour. Great for large projects. This chainsaw comes with the option of the 40V Max 4Ah battery and charger or without the battery pack and charger (if you happen to already own other DEWALT battery-powered tools). The average charge time from empty to fully charged for the 4Ah battery is a little over an hour. There is also a 40V 6Ah battery pack option for longer run time. It’s important to note that while the batteries can be used interchangeably with other power tools, they must be of the same voltage. In other words, you cannot use a 20V battery with the 40V chainsaw. Visit the DEWALT site to learn more about this and other products. Always wear protective clothing and learn how to safely use a chainsaw. Cordless chainsaws offer many qualities that provide safer operation than gas-powered models, but safety is still very important while operating. Misuse of any power tool, regardless of gas-powered or cordless, can result in injury or damage to the machine. Familiarize yourself with the saw – This is especially important if you’re used to using a gas-powered model because cordless chainsaws operate differently and may take some time adjusting. Take a few practice tries on smaller branches and wood pieces to get a good feel for the saw before tackling larger limbs and trees. Always use a sharp saw – cutting with dull chainsaw can be dangerous and also cause undue pressure on the chainsaw, potentially damaging the motor. Also never let the chain hit the ground when running as this will severely dull the chain. Keep your saw well-oiled – Before use, always ensure that the chain and bar are well lubricated. When the saw is not in use, it’s very common for oil to leak out so you may wish to empty the oil reservoir prior to storing your machine. Avoid the Kick-back zone – most chainsaws can cut from the bottom of the bar or the top of the bar, but beware of the kickback zone. This is the top half section located on the top of the chain that can cause anything it comes in contact with to kick back towards the user. Always remove the battery before working on a chainsaw – Most chainsaws are equipped with safety features that prevent the chain from rotating when not engaged; however, you should always remove the battery before performing any maintenance or work on the saw. Read the instruction manual – this step is often overlooked, but is vital to the safety and proper use of the chainsaw. Fully read the user manual guide on how to properly use and care for your cordless chainsaw. Cordless chainsaws offer a great advantage over other types due to their ease of use and safer, cleaner operation. It’s always important to follow safety precautions and be mindful of keeping it maintained when not in use. The models mentioned in this guide offer many qualities that make caring and using your chainsaw much easier.